As you might already know, StackState shines when it comes to providing a unified view of your Information Technology (IT) landscape. The last couple of years we have seen several businesses transition parts of their IT infrastructure to the cloud. However, only parts of the entire IT infrastructure are migrated to the cloud due to various reasons. Obtaining an overview of your entire infrastructure might be challenging when dealing with multiple tools, especially when introducing a whole new platform. Microsoft Azure is one cloud provider that is available today. This blog post focuses on leveraging Azure as a topology and telemetry source for StackState. Microsoft Azure enables businesses to focus on their core business without having to deal with infrastructure and maintenance. Going to the cloud also introduces some new problems. How do you keep an overview of the entire landscape? Do you have a clear picture of the relations between components and/or business units? How do you perform root cause analysis to figure out what is going on when something customer-facing stops working? StackState is able to provide a unified overview of your IT landscape by synchronizing with one or more tools that are already in place. StackState is also able to integrate with cloud platforms. Topology and telemetry information can be visualized and combined with other sources to obtain a unified view. Microsoft Azure's resources like Compute, Application Insights, Application Services, Storage Queues/Tables, Relays, Service bus, Queue/Topics and others can be synchronized with StackState. StackState dynamically keeps track of changes in Azure and keeps your view of the IT landscape up-to-date. Since StackState is able to synchronize with multiple sources of topology and telemetry, this means that StackState can capture your IT landscape from on-premise to cloud and/or from legacy to microservices to serverless technologies. Azure resource related alert rules are used to determine the health state of the component in StackState. Azure's telemetry streams can be used to configure additional StackState health checks for greater flexibility. Synchronized Azure resources can be enriched with telemetry streams originating from various other tools, such as Splunk. Enrichment is not only limited to telemetry streams, additional information from e.g. a Configuration Management Database (CMDB) can also be synchronized to provide more information about a component from a topology perspective. Depending on your use case, StackState is able to show a specific part of the entire IT landscape in a view. Views are especially useful to provide a level of detail that is required by the given use case. For example, DevOps teams are responsible for their portion of the business entities providing the ability to perform root cause analysis across tools and teams. A logical business unit usually consists of multiple Azure resources, and/or non-Azure resources. It is possible to only show resources belonging to a particular logical unit within a StackState view whether you use one or more resource groups, and/or use naming conventions, and/or use Azure tags. 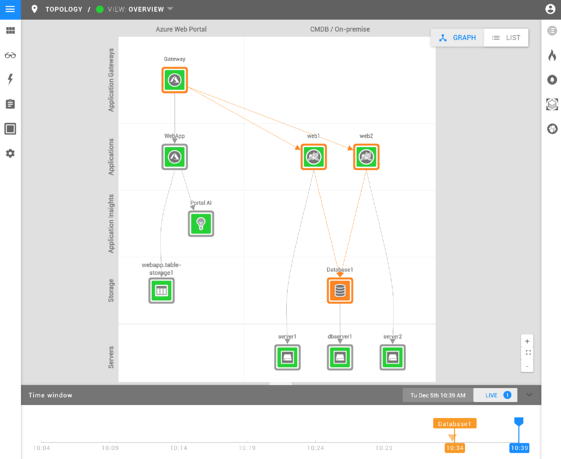 Azure's Application Insights also provides some insight through its Application Map. However, Application Map is limited to the scope of Azure and the resources that are visible to that instance of Application Insights, which requires you to have an Application Insights configured. StackState is able to include much more resources, such as other clouds, tools and other types of data that are already available in your business. Consider the following simplistic IT infrastructure. The infrastructure is dynamically synchronized from multiple configured sources. The sources include Azure, a CMDB, and a telemetry store like Splunk and/or Elasticsearch. In Azure there is a rule based application gateway configured to direct incoming requests to either a .NET application service or to one of two Apache Tomcat web servers that are hosted on-premise. Azure's Application Service 'WebApp' has an Application Insights instance configured and writes data to table storage. On-premise components are synchronized from a CMDB which contains two Apache Tomcat webservers and a database hosted on several servers. It is shown that Database1 is not in a clear health state. The database's health affects the components that depend on it. Since dependency logging is enabled in the .NET application, the relation going from WebApp to 'webapp.tablestorage1' is synchronized from Azure. In the timeline it is visible when the state of the database component changed. This shows that StackState provides a unified view of the IT infrastructure by synchronizing from multiple topology and telemetry sources. We are excited about our partnership with Microsoft and the value it provides for customers through integrating the best Algorithmic IT Operations platform with a world-class cloud platform. When you mix Microsoft Azure with the broad range of integrations we provide, you gain a uniform overview of your entire IT landscape and gain new insights into optimizing your business that is powered by Azure. Ready to get started? Try StackState now and experience the world's first Algorithmic IT Operations platform.